Every once in a while, someone asks me to share more about the process by which I get to making what I make. Occasionally, I try to answer but most of the time, I either forget or it all happens in my head so there is nothing to show but the final result (Ok, and pattern pieces...). 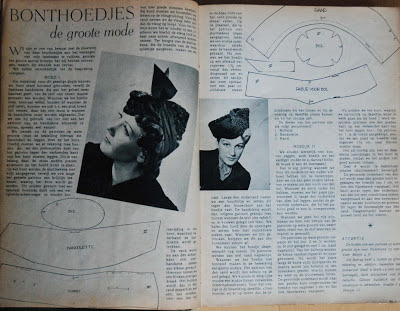 In fact, I often start drafting a pattern just based on an idea in my head. But just as often, I will try the idea out in a very rough sketch first. This can also serve as a means to 'capture' it and stop it from getting away. 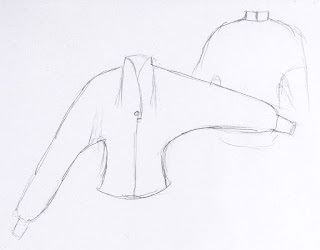 In the pictures I just added to the 'retro detail' post, you might be able to spot such a sketch (although it's really hard to see) proving how I may just use any bit of paper I can find for this. This is a better picture of the other side of the cuff pattern piece (the side shown before has just one sketch), which has a sketch for the top I was making (I was still considering neckline options while drawing) as well as a couple of others which are all different twist designs, under consideration for a grey rib knit I bought recently. All of these are 'thinking on paper', the different twist designs will, eventually result in one top. A marl grey one, which should go really well with the colourful skirts I've been making this winter. Here's another sheet of 'thoughts' (all original except the one on the top right. I altered that one just before scanning, to show what I really want the back to look like. You can still see it's lighter original lines). It's a dress design which was brewing in my head for a while before I tried putting it on paper. It started with the re-surfacing of this fabric. A dark grey cotton stretch velvet which I had obsessed about before, way back in 2010. 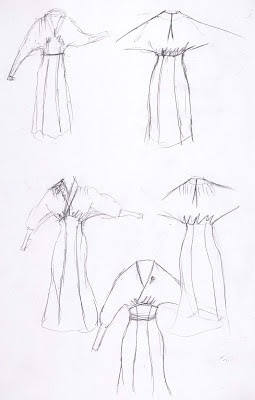 This time, I was think 'kimono sleeve', '30's inspiration from the bustline down' and 'maybe something like a shawl collar'. After the first sketch, I was disappointed with the idea. It looked too much like this dress, which I love and still wear a lot, but it's not what I wanted for the velvet. 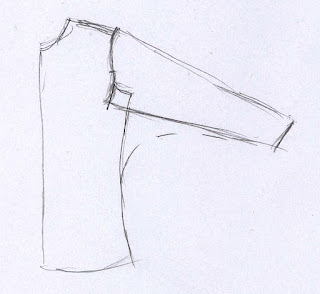 I got thinking about Asian influence and mostly, the things I love about Pattern Magic's wearing a square: the odd shoulderline created by the 45 degree angle, the roomy-ness with the blousing at the back and the neckline (which I could make more fitted by pulling a bit of it into a pleat at the back. This thinking eventually led to a sketch I am happy with: the one in the center at the bottom. 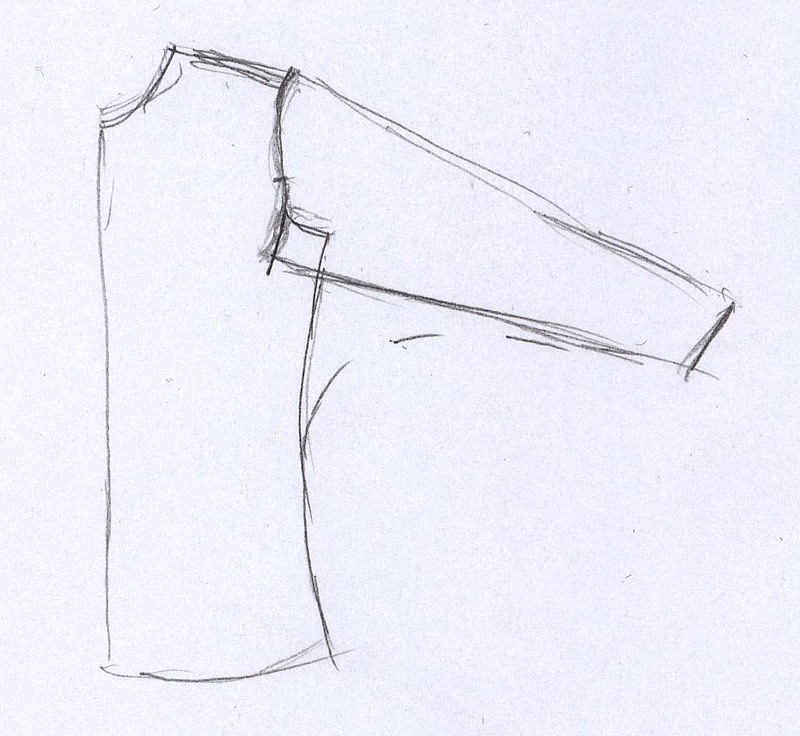 I still worried about construction details: I don't want wearing a square's underarm triangles, nor it's tendancy to pull the entire garment up if I lift my arms but I would, in theory like not having an upper arm seam... Which brings me to wondering about this design in relation to the nature of the fabric: how to deal with the pile? According to what I've learned, you cut velvet tops with the 'hairs' pointing up to show the greatest depth of colour. On skirts or trousers, they should point down to avoid ugly pale spots when the pile gets crushed (which will inevitably happen with sitting on it). I asked M about the 'rule' for velvet dresses and she said a dress with a horizontal seam should be cut according to the 'top' and 'bottom' rules for the respective pieces. On a dress without horizontal seams, the pile should point down. I checked my fabric in front of the mirror and I didn't think the 'meeting' of different directions looked weird at all. In fact, even having the upper front on the crossgrain (where it would end up if I cut it like wearing a square) didn't look odd. So, this is where I am now: ready to start drafting as soon as I have enough time and energy for it. I think I should muslin that bodice before cutting into my velvet, just to be on the safe side. I'll keep you posted! If you read Debi's blog you'll know all about her big project already: she has set herself the task of making every McCall's (back then "McCall") pattern from the year 1940. She introduces the project here and explains more about it here and here. I think it's a huge project for which I can't imagine summoning the focus and dedication. There are just too many other things I like to focus on whichever year in fashion history... but I'm really looking forward to following her progress. Also, as a bit of a history geek, I always feel a bit weird discussing years, marked by major historical events, in terms of fashion. In the country I live in, World War II started, quite suddenly, in May 1940. Of course, McCall('s) was, and still is today, an American company, so that just wasn't the case for them. These images are from the first week of the year. Although Debi focusses on designs with a copyright from 1940, this would still show the looks in which those McCall designs would be worn. Then, dresses and suits are discussed. 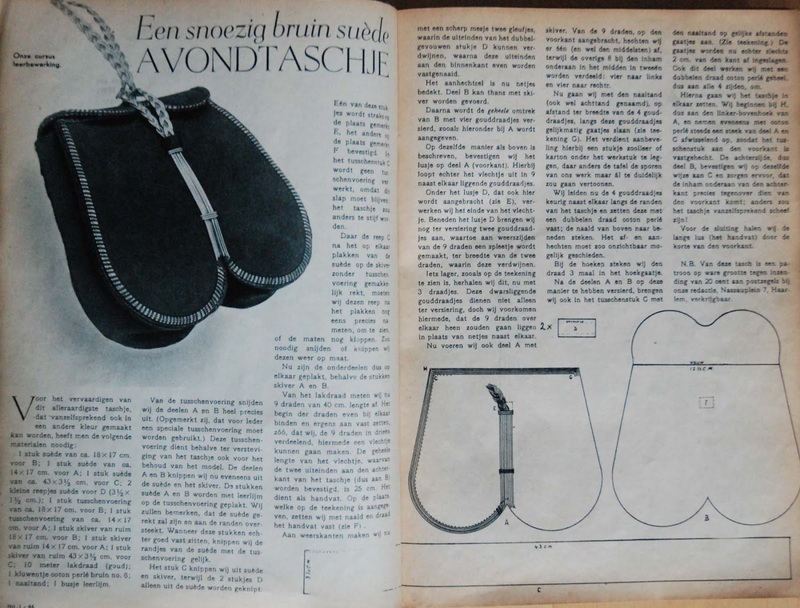 Although the article is about styles offered by Dutch manufacturers, it is illustrated with designs from Paris (which are, of course, the direct inspiration for those Dutch products). 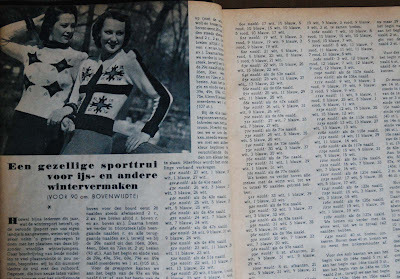 The text laments the short skirts and shows some relief at not seeing a lot of very wide shoulders. I am more used to fashion pictures from the 1950's so I consider the shoulders in both the dress and the two suits to be very prominent. Magazines like this one would always offer sewing patterns which their readers could order at a small fee. 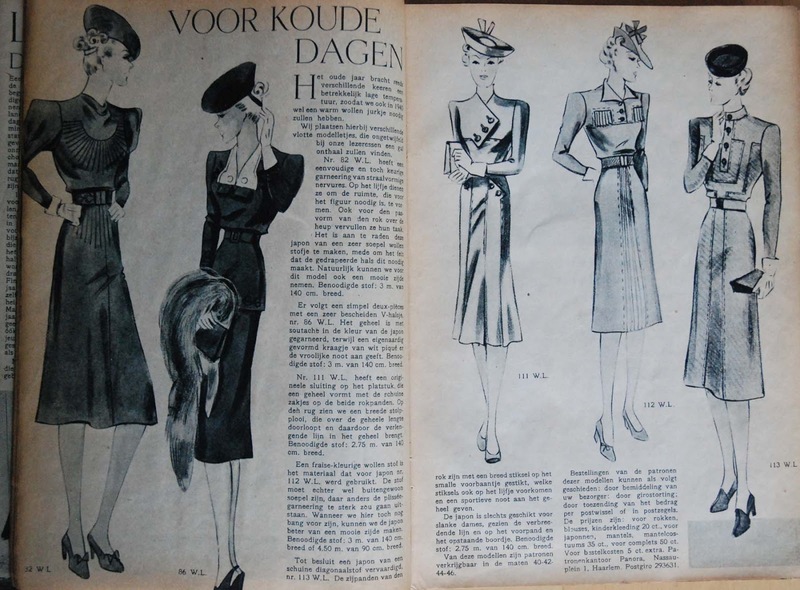 These lovely dresses could be ordered throughout January 1940... I really like the one with the diagonal button closures. And cozy slippers. And some babies' and children's stuff as well, but I didn't take pictures of that. Even at this early date, a bit of make-do-and-mend is already in evidence. Although in this case it's about re-using the good bits from a worn-out fur coat. Since fur was always really expensive, maybe it doesn't mean that much. These hats are really lovely though. Too bad the printed pattern pieces don't come with the scale clearly indicated (you could the full size pattern sent to you) or I might have tried out that one on the right in fabric and/or fake fur. 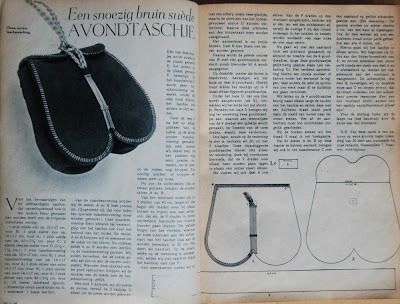 And there's also this pattern and discribtion on how to make a suede evening bag. And for those readers who would like to make their on clothes but don't feel quite confident about their skills, there is Libelle's sewing class: this instalment is about pleats. And that's all for the first week of January! If you like this post I may continue with the following weeks. It has kimono sleeves, a neckline which curves at the front to a stand at the back (the entire collar is cut on the front pattern piece) and, as a special retro 1950's style detail, pleats from the neckline providing the bust coupe. 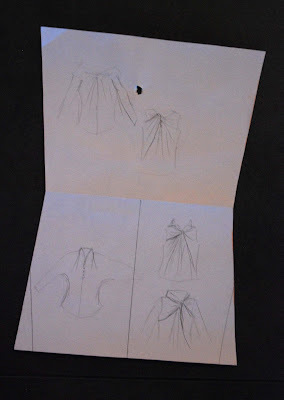 Melissa asked for a picture of the pattern piece (which I still forgot to take... it's dark now, but I'll add it tomorrow) but I thought a little tutorial might explain more. Melissa's comment reminded me I hadn't yet added the picture of the pattern piece. I'm posting a couple now which might be useful. 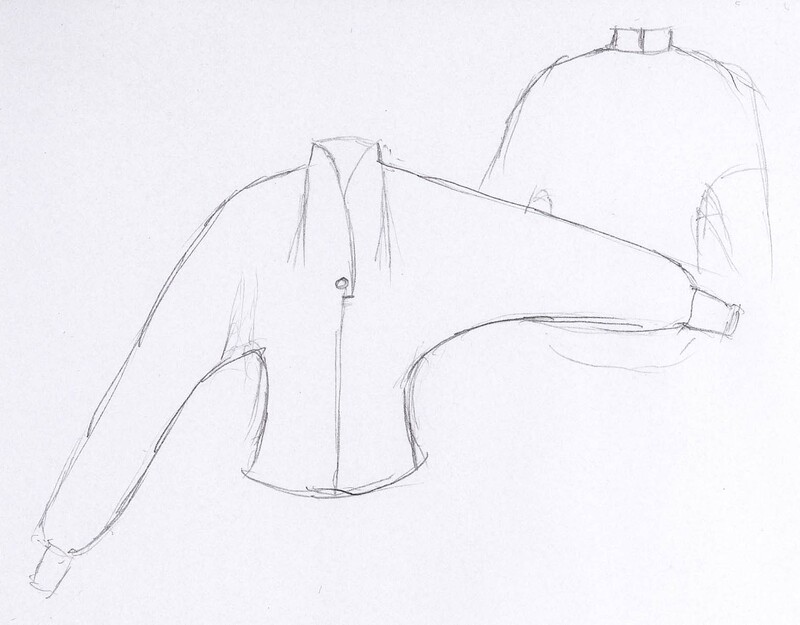 And I'm adding a technical drawing (well, a sketch of one) to clarify the design of the top. Please ignore the line cutting the right sleeve in the back view. That's sloppy sketching, not a design line. I really only added a back view to show the back of the neck. Other than that, there are no seams at the back. From left to right: cuff, back, facing, front. It is, in fact, a simple matter of dart rotation. And of converting a dart to a pleat. 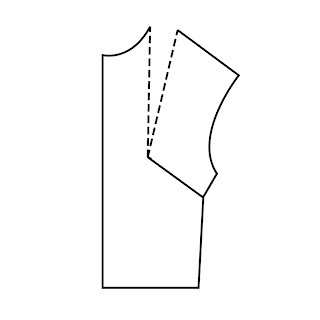 This feature can be made on any kind of bodice which has a bust dart and a shoulder seam for, at least, a couple of centimeters next to the neckline (which means it can be used with all bodice-sleeve combinations except full raglan sleeves). It is most often used with shawl collars or cut-on standing collars like mine. I can see no reason whatsoever why you couldn't use this feature with, say, a notched collar or a classic shirt collar but it's less of a 'period' look. It may be easier to use a sloper because on those, the bust dart ends at the bust point. 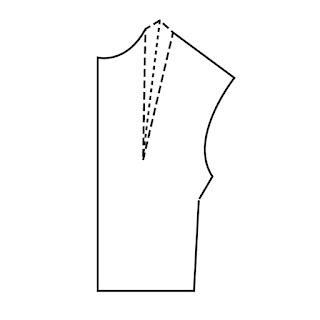 In a normal clothing pattern, the bust dart is usually shortened, often by about 3 cm. To do any kind of dart rotation, you have to determine the actual bust point on the pattern (and make sure it is the actual bust point on you). 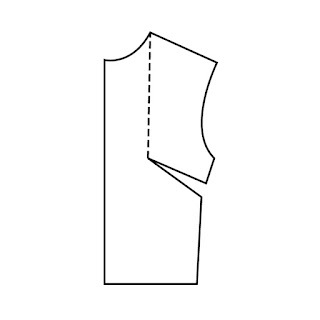 Some pattern companies print a bust point and/or the line it should sit on, which is a huge help. Anyway, take your sloper or lengthen the bust dart on a commercial pattern to the bust point. Copy it onto a piece of paper. 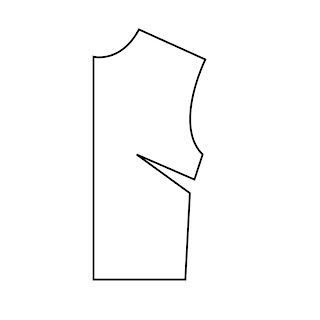 Draw a line from the bust point to the tip of the shoulder seam (picture shows a pattern without seam allowance). 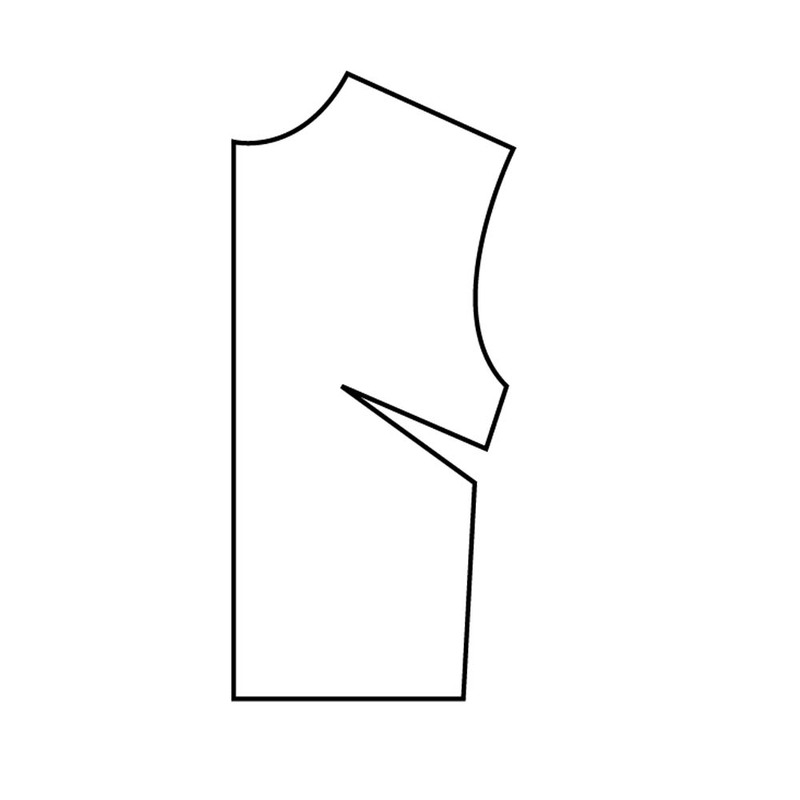 If you plan on combining it with a type of collar which has to be sewn on at the neckline, draw this line 1 to 1.5 cm further down the shoulder seam to avoid bulk. 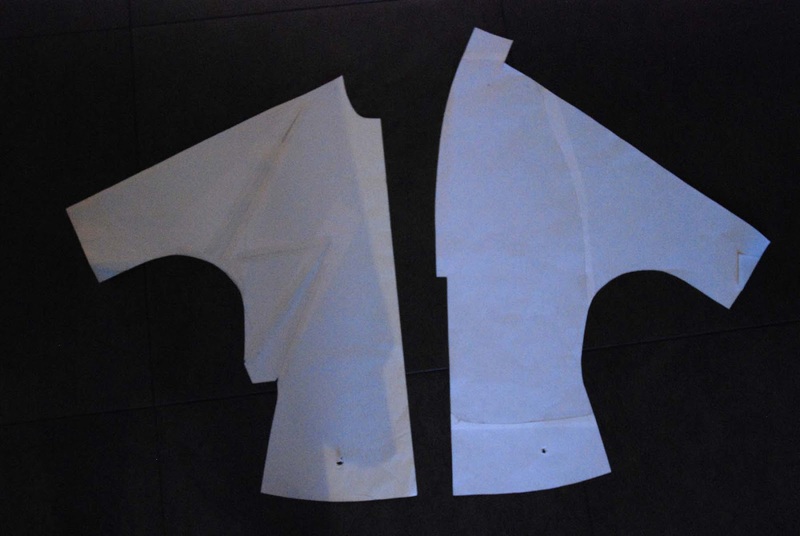 Cut along the new line and the dart and rotate the shoulder section until you've closed the original dart. The newly opened 'dart' is your pleat. 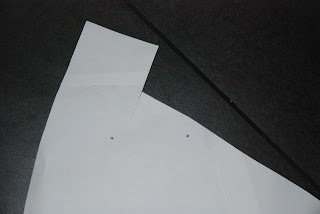 Make sure to mark the points which have to be sewn together with notches and to cut enough extra material at the center of the pleat so it can be sewn into the shoulder seam later. 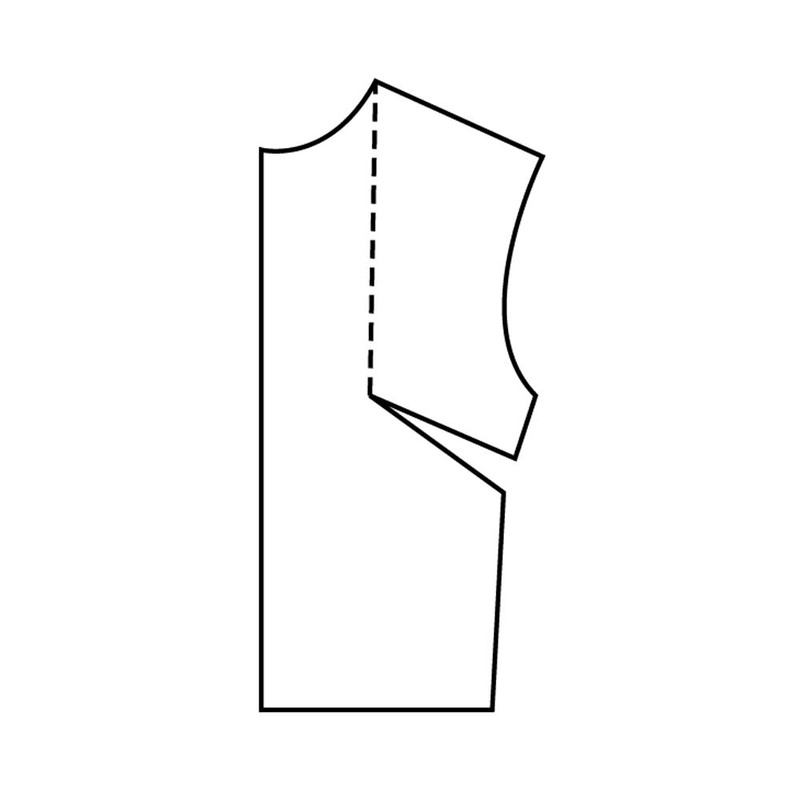 When sewing the top, match the notches for the pleat, press the pleat (on the inside) towards the arm and anchor it by stitching in the seam allowance. 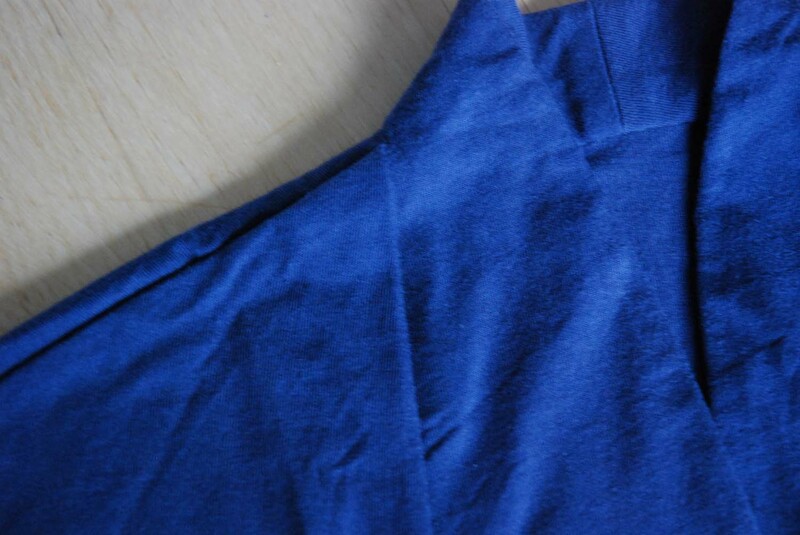 Then, stitch the shoulder seam as usual. 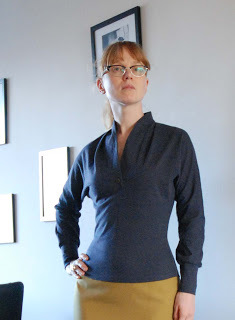 The original version with a dart from just above the waist at side seam is at the left, the new version (with collar and overlap for the button closure) is at the right. I hope this is easy to follow. As ever, feel free to ask questions by commenting or emailing and if you use this tutorial and show it off online, please refer to this post. 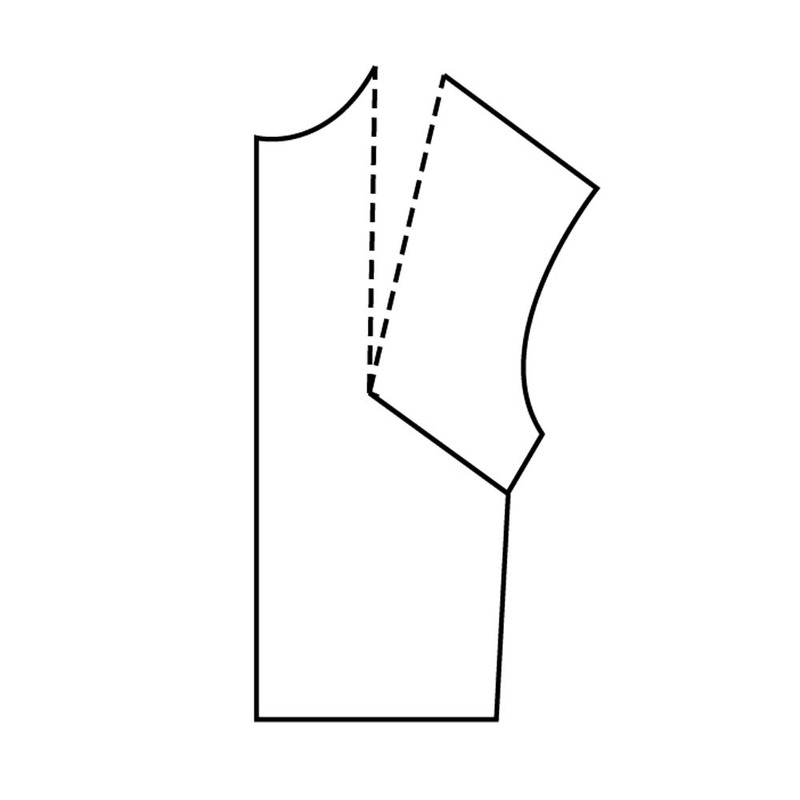 Cut the sleeve pattern lengthwise in half (the notch for the top of the sleeve markes the seperation between front and back. 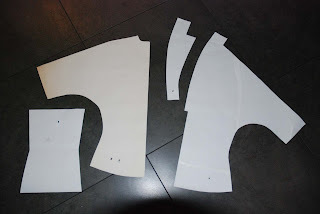 Start there and then cut parallel to the straight grain line) and match the pieces to the front and back bodice at the top (usually, the sleeve tops should end up to 1 cm above the tip of the shoulder) and at the sleeve notches. 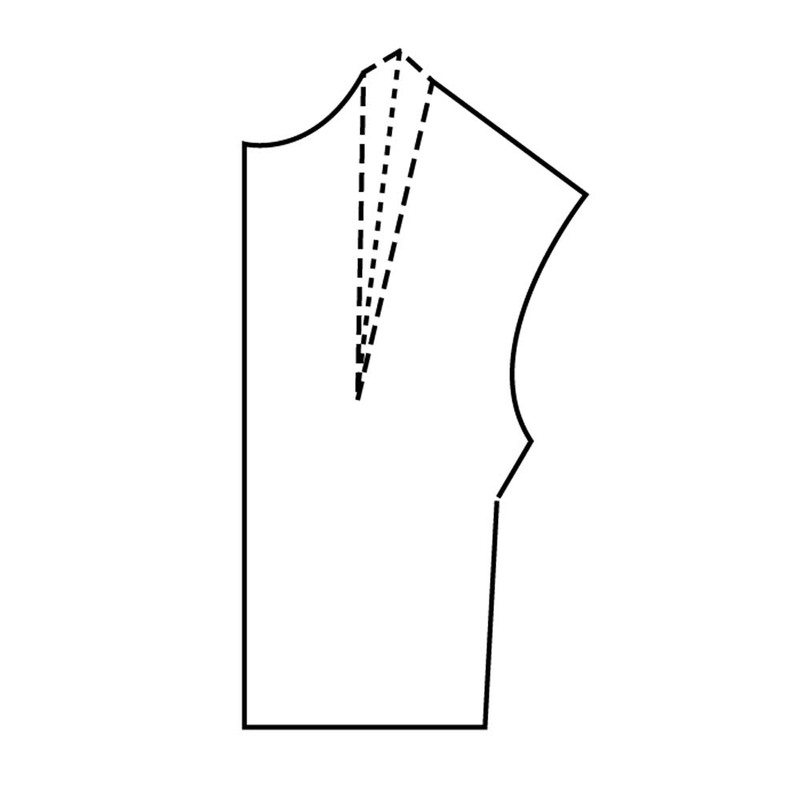 Allow a bit of room (about 2 to 3 cm) between to notches of sleeve and bodice to create ease for movement. Draw a curved line from bodice to sleeve. For my tops, I start this line at the waist. 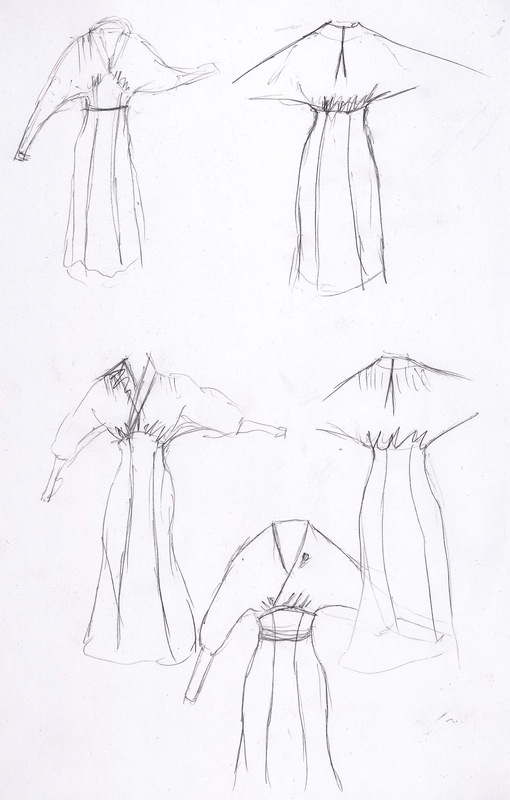 This is a simplified version of how-to-make-a-kimono-sleeve. This is actually a blend between the wide and the fitted kimono sleeve which needs the stretch of a knit fabric. In the previous post, I promised to try and do some non-sewing posts last week. Well, I tried and failed. Since then, we've been working non-stop to complete the collection in time for last Sunday's and Monday's trade show. I spent the past week and a half working eleven-hour days and slogging through the snow to get to and from the studio (the Netherlands were hit with a cold spell, including heavy snow last Tuesday and Sunday). Which turned out to put a serious damper on my blogging mojo... I'm sure you'll understand. After that, it was two days of standing around in high heels, smiling kindly and generally trying to make the best possible impression on anyone who took the time to stop at our stall. All the big brands send their crack sales people to such events, and with good reason... I'm by no means a natural at this so I find it very tiring. Fortunately there were the three of us: M herself, me and a girl who recently did work experience with her and has that elusive social talent. 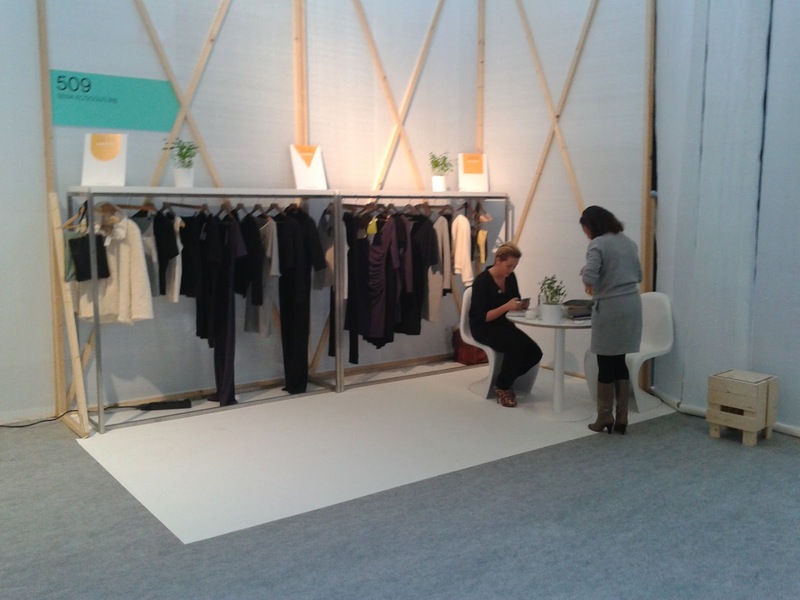 And fortunately, the new website for the label, Sena ecocouture, was finished just in time (the English version isn't finished yet and this new collection we took to Modefabriek is not on the site or obvious reasons. 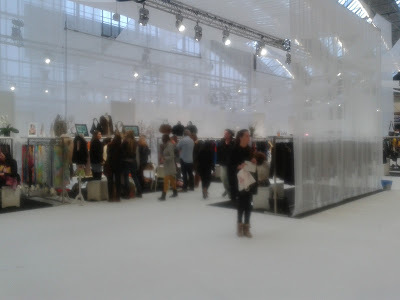 But can have a look at the collections for autumn/winter 12/13 and spring/summer 13. Oh, and it's not a webshop and, at least for now, the clothes are only available in a few stores in the Netherlands. Expanding points of sale is why we go to trade shows...). M and EL at our booth, getting ready for the day ahead. 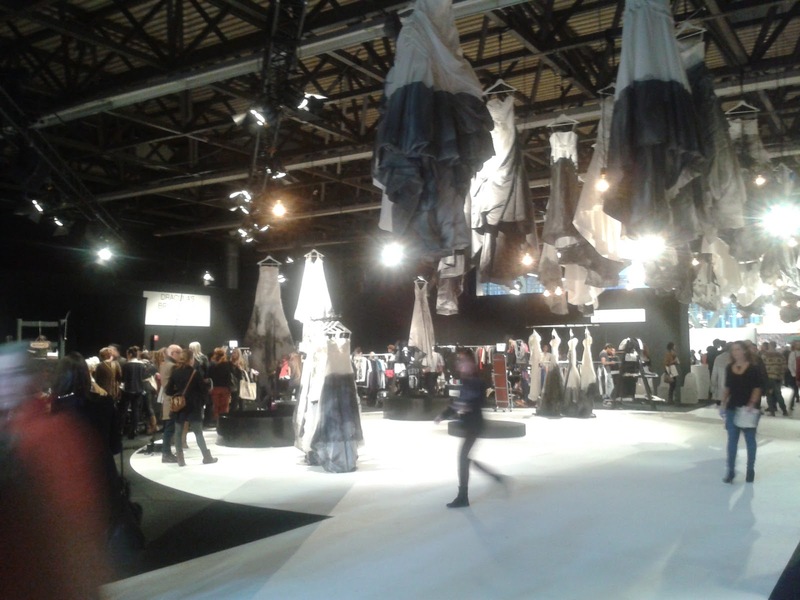 This is not Fashion Week (even though the event takes place at the start of the Amsterdam Fashion Week). There are no runway shows, no celebrities, no models (although some brands have a couple of models at their stall) and no superstar designers. 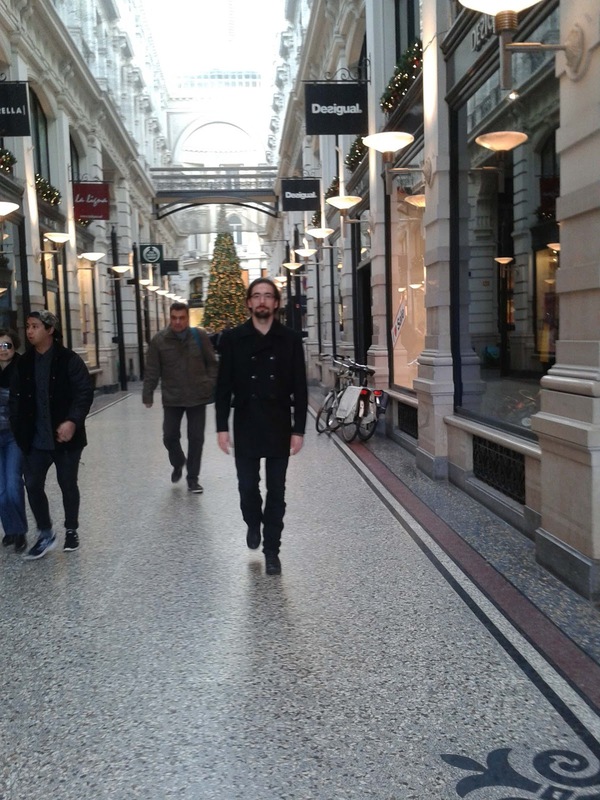 This is a giant event space which is converted for two days each season (in January and June) into a giant shopping center for shop-owners and -buyers. At Modefabriek there is a lot of womenswear, there's also menswear, jeans and some accesoiries like bags, scarves and shoes (there are separate trade shows for children's wear, plus sizes, bodyfashion and real outdoor and sportswear). 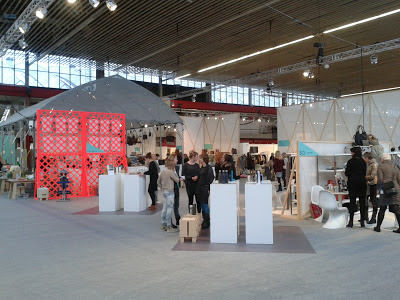 Brands either rent their own booth or are represented by t-heir Dutch agents. In the main sections, the booths look like little stores with three walls, open the aisle. Brands dress up this shop-space in their own colours and bring in manequins, furniture and props. They may also use such means as champagne, cocktails, sweet or savory nibbles and goodie bags to lure in the buyers (although this time, that seemed to be done less than before). In some smaller sections, different rules are set to allow smaller brands with smaller budgets to be present as well. 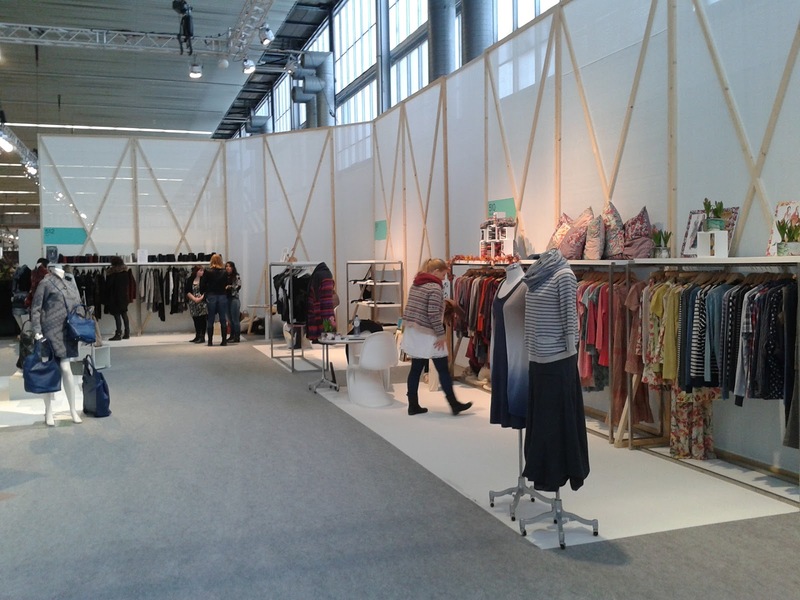 This time, the old "young designer" platform had been replaced by a section called "Refined +" which included young designers presenting their brands as well as a selection of other small high-end labels. Here, booths were smaller, more uniformly furnished and only separated by white curtains. In "MINT", the section we were in, effort is made to create an experience which is more 'market square' than 'shopping mall'. There are no dividing wall between the booths and all of those are furnished in the same way. In the central pavilion, there is a cafe, a small shop (a real one, selling novelty goods) and a DJ playing music. Only 'ethical fashion' is allowed in MINT. This means all goods shown here are either ecological or fair trade or both. I didn't take detailed pictures of any of the stalls because a lot of brands get very nervous about protecting their designs. 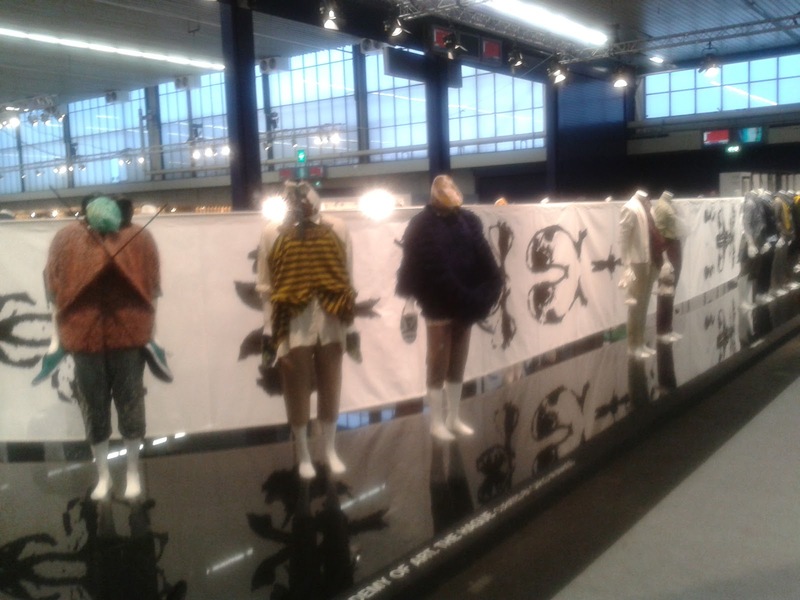 Next to the serious shopping business, the was also a display of menswear made by fashion students of the Royal Academy of Arts. Not very wearable, but fun to look at. Although I did get to walk around a bit, the vast majority of the past two days I spend at our own little stall, with increasingly painful toes... This morning, I slept late for the first time in two weeks. Over the course of the coming week, normal life will resume. To be honest, I'm not quite there yet. In the coming week, I'll be helping M in the epic struggle to get her collection ready for the Modefabriek trade show on Sunday 20 and Monday 21 January. I'll explain more about that later. There will be simply no time for any personal sewing projects in the coming week, just as there hasn't really been any in the past week. Of course, I have plans, I always do but I won't be able to translate all of them into reality and, at the moment, there's nothing to show. 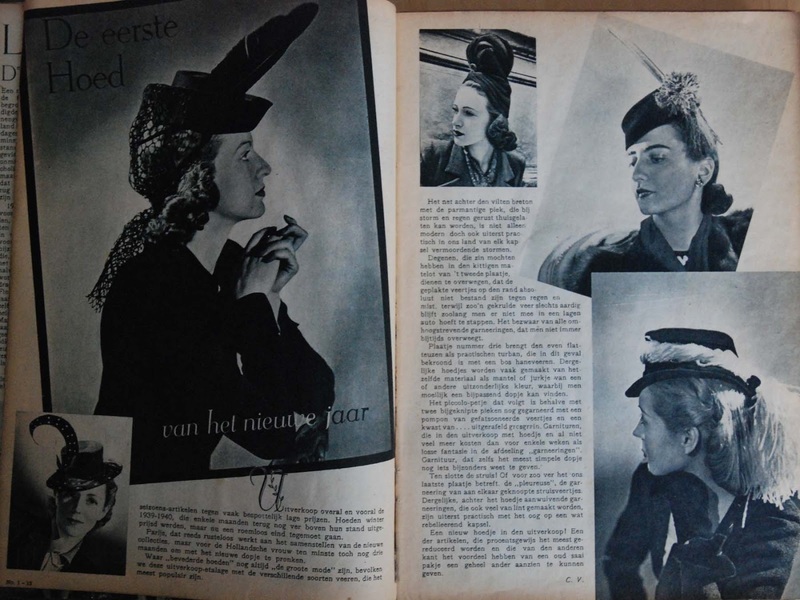 I hope I'll find some time to share interesting images from my still growing collection of vintage magazines. To be specific: from a very peculiar little 1930's knitting and crochet booklet. 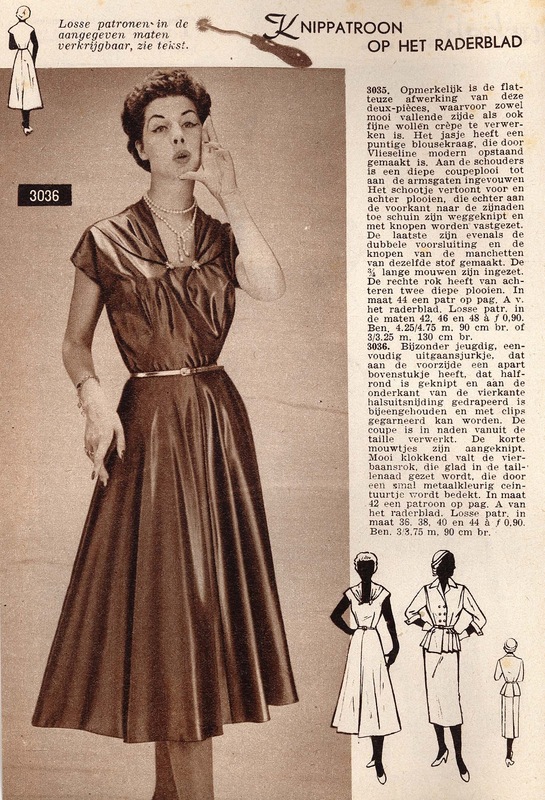 And/or from mid-1950's French Elle. - In a comment to this (skirts and tops) post, Melissa asked for a picture of the pattern piece for the top with the 50's style neckline pleats. I think I can do one better and put together a little tutorial about how to create this feature from any regular bust dart. - Debi will host a new round of the Sew Grateful Week over at her blog in early February. Even though I'm not that good at this kind of themed posting, it would be really nice to join in with one of the days (probably with another tutorial or a simple pattern). 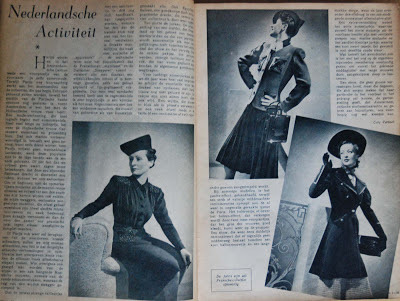 - I think that collection of vintage magazines of mine may contain some things which fit in with the specific areas of interest of other bloggers. I should really scan and send. Oh, and along these lines: I would like to offer my sincere apologies to those of you who have commented on this blog or emailed me, last year about cool sew-alongs, blog prizes or campaigns. I always mean to respond to such posts but I often forget, and if I respond (as I did to the very cool initiative of the Pattern Magic Sew-Along. I don't even remember who hosted it...) I still forget to follow up on it. I don't mean to be rude to anyone, I just never quite manage to keep track of all that's going on in the blogosphere. This morning, I finished E's new coat (I guess I could have done it last night, but Downton Abbey was on). I think I've already explained some of my thinking behind this design. I wanted to make this a somewhat classic coat but one which would still work with E's casual dress sense. This is why the back isn't that fitted: he needs to be able to move around in this thing, it's not purely a show-piece. I think I made three muslins to get the pattern right (self-drafted of course, based on a casual jacket block made years ago), dealing mostly with the width in the lower half and drag lines at the shoulder. 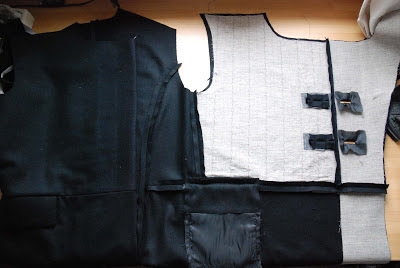 On the real coat, I used horsehair interfacing in the upper front panel, all facings, the collar and along the black vent (I paid close attention to the vent in the muslin stage: I think it's such a bad look when a vent is permanently gaping). I also used a type of shoulder pads made from layers of thin foam and I put half of a third one on the right shoulder pad. I'm really pleased with how that turned out: no drag lines, even shoulders and no excessively heavy-shouldered look. And I made bound buttonholes, as I've shown you before. This weekend, I bagged the lining and sewed the hem facings in place, by hand on from the inside, after attaching the lining (I'm just mentioning this because apperently, it's not a standard construction order and it can potentially save quite a bit of hand-sewing). Then, I attached the backs of the buttonholes and sewed on the buttons and a snap on the inside. 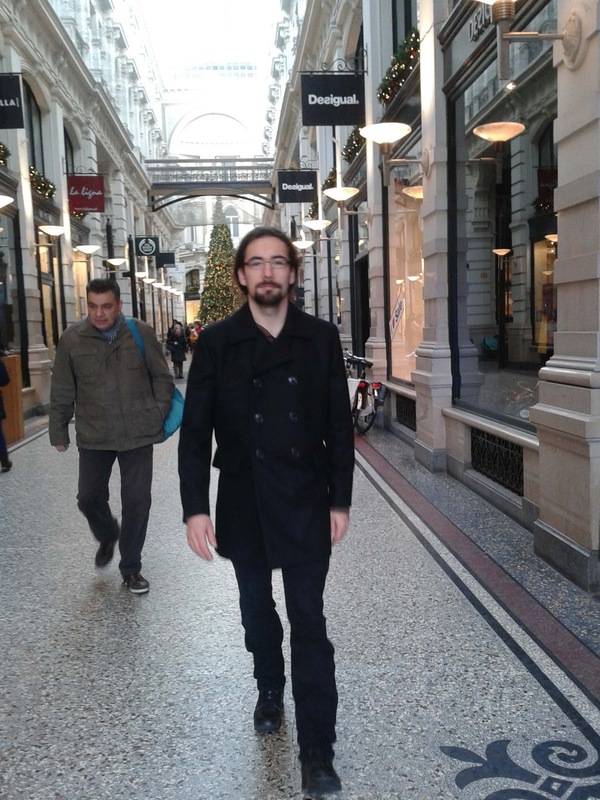 All in all, I'm rather pleased with this coat. I think it looks quite good on him. And I hope I can discourage E in his unfortunate habit to pull the sides of the coat up to stick his hands into his trouser pockets. This is (about) where it's at. After cutting fabric and lining, I had to make some decisions about interfacing. And I had to find buttons. I knew I wanted to make bound buttonholes and in those are best done early in construction, so you won't have to deal with a huge slab of already-constructed garment. I found plain and simple, but large enough, black buttons on the market last week (a card of 12. I need 6 for this coat but hey, they're black buttons...). And as for interfacing, this lovely, fairly thick, densely woven black wool just screams out for the use of horsehair... Looking back, I can't imagine why I didn't use any on that previous coat. I still had some fusible horsehair (yes, that exists. I bought it some years ago when I was looking for the regular kind. It sticks really well and makes for a very stiff interfacing which is why I haven't used it in a lot of projects. For a fabric like this though, it's pretty ideal) which I used for the facings, collar and pocket flaps. Because this coat is a bit more formal and a bit more fitting than the old one, I decided to interface the upper fronts as well. For this, I used normal horsehair interfacing (also because I ran out of the fusible stuff which I originally bought in a closing-down sale) Which I stitched on by hand at regular intervals. I will also do some real padstitching for lower lapels of the collar later. After taking this picture, I also inserted the sleeves and made the collar so the lining is next. Not my favorite part, lining fabric is always disappointing after the nice stuff used for the outside, but definately worth it. P.S. Just a comment for those of you reading this blog on a mobile phone or use the RSS feed: I've altered the sidebar last week and it now contains a blogroll and a list of links to all my tutorials. A happy and healthy New Year to all of you! 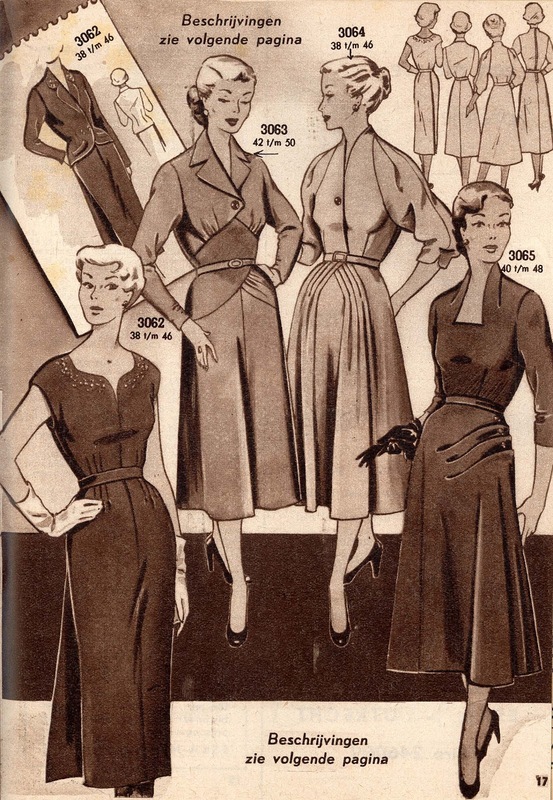 It may be general sewing blogging tradition to review one's year of sewing (a tradition I have conformed to in some previous years) but instead I'll show you what we might have been sewing today, 60 years ago. 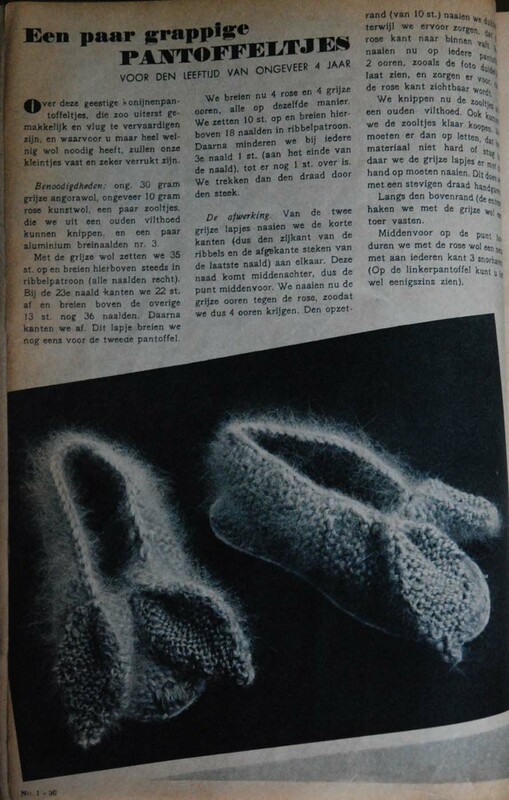 The following images are all from the Januari 1953 issue of Marion. 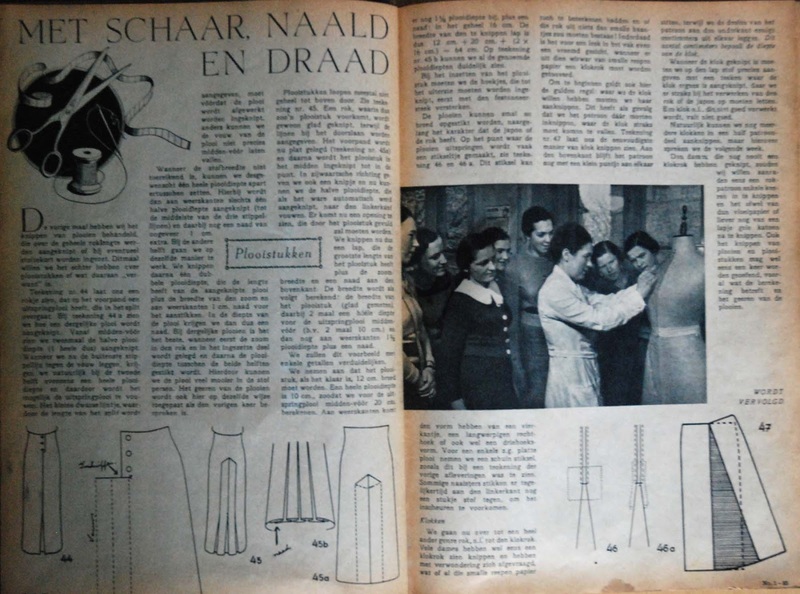 As usual with this magazine, a couple of designs are included in one size on the pattern sheet, but most aren't. 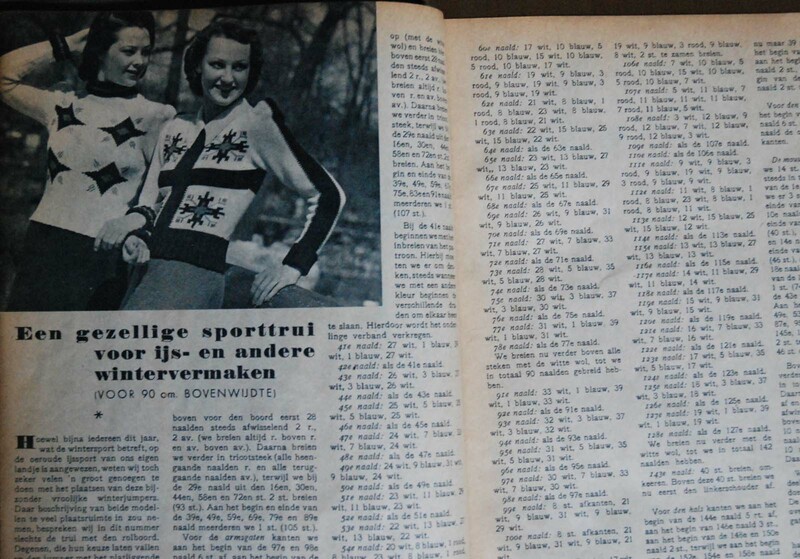 Apperently, the tradition of New Year's parties well into Januari was already well-established back in 1953 because that's the only way to explain the generous serving of party wear in this magazine. 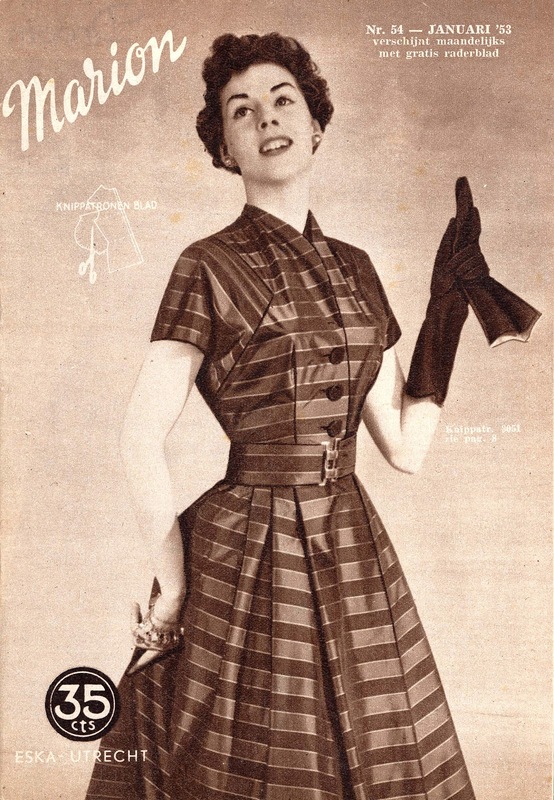 The cover design already looks a bit festive with its short sleeves and shiny stripes and is, indeed described inside as a cocktail dress. 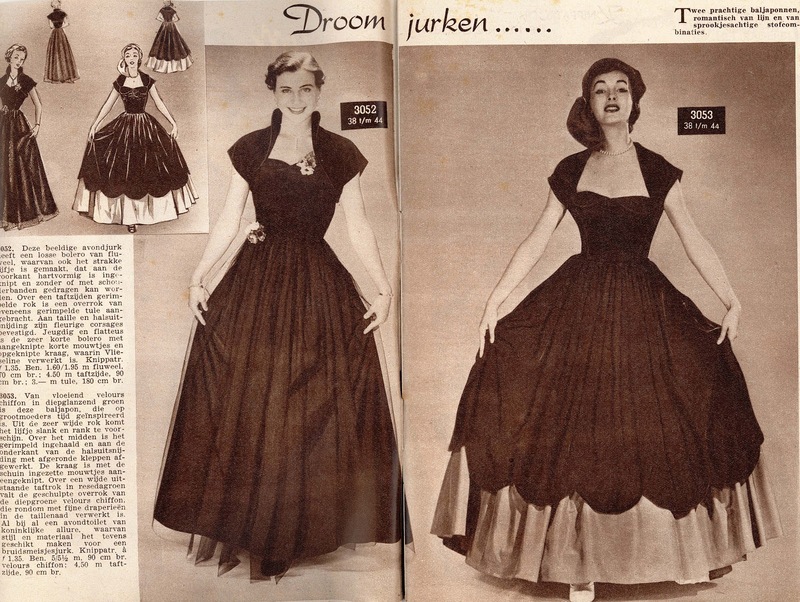 The first pages take a step beyond with two actual ball gowns. The one on the left can be made strapless or with shoulderstraps and is worn with a bolero, the one on the right has a very wide skirt and scalloped bits decorating it and the neckline. Dramatic they may be, but I'm not a fan. To be honest, I find these to be the most costume-y and least inspiring outfits in the entire booklet. Then, there's another taffeta cocktail frock. 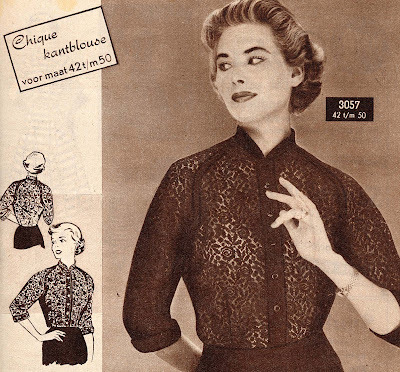 As you see, serious clevage was for grand evening attire only in the Netherlands in 1953. 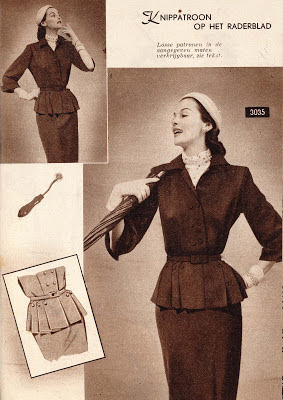 Next to it, is a very dressy suit with a peplum shaped with deep pleats which, at the front, have been partially cut away and buttoned down. Such an interesting detail. And even teenage girls might just get invited to their first ball... Despite the apparent youth of the girl in the drawing, this pattern was available to order in the sizes 14-16 years old, 38 and 40. So it's really more of a 'small ladies sizes' than a 'kids' dress. It's not all party pieces though, there are some pretty casual designs in this issue too and then, there are these. Pretty dresses with interesting details. They're all chique designs but fabric choice would determine whether they belong at a cocktail party or in the salon. I really like those two on the right.